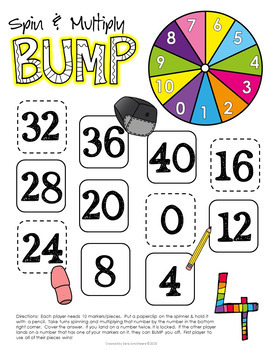 Bump is an easy and fun way to practice math facts and fluency in the classroom. 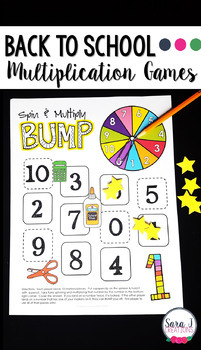 In this version, Spin & Multiply Bump - Back to School Edition, students can practice their multiplication facts by number. 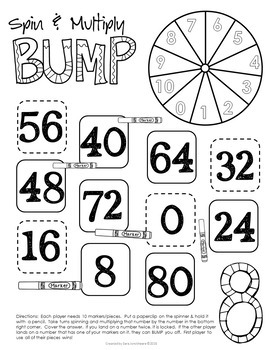 There is a different game for numbers 1-10 included. Each game is in color and in black and white with school supply pictures. Print and play! All you need to add is a pencil and paperclip to use as a spinner and then 10 markers/game pieces for each player. Directions are printed on the bottom of each game. 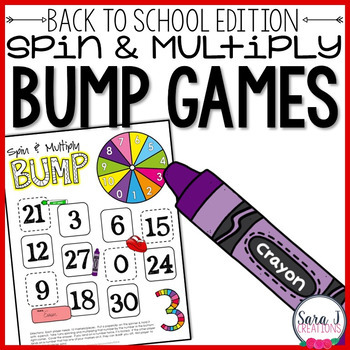 This game is designed for the beginning of the school year but could really be used all year long. If you are looking for other holidays or seasonal versions or simply want a generic version, check the links below!